What was true in 2010 is still true today. That is, that Mann's original execrable paper was a downright shoddy piece of work which should never have seen the light of day, let alone be shoved onto the front page of an IPCC report. The reason it did so can only be because it said what so many people were desperate to hear. An execrable shoddy piece of work that has been repeatedly confirmed. Once again, all you do is use name calling unbacked by facts. I presume you are referring to the NY Times which is very obviously a 'pro alarmist' newspaper with regard to climate change. Attached are a few links which reveal this. I agree with Rick. You'd better inform the IPCC about this, because they stopped using the Mann Hockey Stick graph years ago. The conversations in the hacked Climategate emails strongly imply that the existence of the Medieval Warm Period, and the following Little Ice Age, were seen as very problematic for some of the research scientists, because as soon as you reveal that there have been other warm periods in the past that could not have been caused by human emissions of CO2, you cause people to become skeptical and encourage them to wonder if the current warming might be mostly natural. The Hockey Stick was designed to solve this problem, and maintain or increase the alarm. The justification was not so much that the MWP and LIA didn't exist, but that they were not global events and were confined mostly to Northern Europe. "(1) The Little Ice Age (LIA) in China began in the early of the 14th century (1320s) and ended in the beginning of the 20th century (1910s), which was composed of four evident cold stages and three short warming stages. The cold period in the Wei, Jin and South-North dynasties (210s–560s) was the only one comparable with LIA for the past 2000 years. (2) The Medieval Warm Period (MWP) in China began in the 930s and ended in the 1310s, which was composed of two warm stages over 100 years and a cold stage less than 100 years." But that's not conclusive. The problem that many people seem unable to appreciate is that climate does not change uniformly across the entire planet at the same time. Whilst one part of the world might see an increase in average temperatures, another part will see a reduction in average temperatures. Whilst one glacier in a particular location retreats, another glacier in another country advances. Whilst the Arctic loses ice over a certain period, the Antarctic gains ice over the same period, and so on. Getting a precise average of the entire process is extremely difficult. There's always a degree of uncertainty. You're assumption is bizarrely clueless since why would the NY Times, in your words a "pro alarmist newspaper" impeach the honesty of Mann et alii. In fact, it was the Times of London, a that favors denialists, that apologized for the dishonest piece that broke the so-called Climategate scandal. And I don't know what you mean about the IPCC and the "hockey stick" Do you mean that they don't use the image? So what? But they most assuredly do accept the finding. Even though they are very cautious and continually underpredict the rate of global warming. We know this because they have repeatedly adjusted it upward in every report subsequent to the one that featured the image of the hockey stick. but it's not relevant to the question of rate. "One, just out in Nature Geoscience, featuring more than 80 authors, showed with extensive global data on past temperatures that the hockey stick's shaft seems to extend back reliably for at least 1,400 years. Recently in Science, meanwhile, Shaun Marcott of Oregon State University and his colleagues extended the original hockey stick shaft back 11,000 years. "There's now at least tentative evidence that the warming is unprecedented over the entire period of the Holocene, the entire period since the last ice age," says Mann." As for your obfuscation about the average temperature increase of the atmosphere. Clearly, you've never heard of Richard Muller. He was an eminent physicist who was very sceptical of claims about global warming. So wealthy denialists funded him to create a dream team to impeach the claims of climatologists. He used billions of data points and statistically sliced and diced them every which way. And what was the outcome? His team's results exactly confirmed what climatologists had been saying for so long. And naturally, when presented with this evidence, the denialsts graciously conceded they were wrong. Okay, everything up to the previous sentence was true. As for that sentence, not so much. Possibly, the intelligence of a person who poses such a question, might be assessed with a not entirely favorable conclusion? If the people hyping climate change were not in the press a good deal of the time, then most people would not even notice anything happening. Farmers have known for generations that there are good years and bad years for weather. Actually, farmers are among the people most aware of climate change and how on average, the climate is getting warmer and warmer. The idea of a "threat" is not really a question for scientists anyway. They can make computer models predicting whatever disasters they choose, but it is really in the realm of economics to decide whether this represents a "threat". The Nobel Laureate William Nordhaus﻿, who is perhaps the best-known specialist on the impacts of future climate change, recently collated studies from around the world estimating the damage caused by climate change by the year 2100. The results were: Not much, even at the extreme estimates of temperature rise. 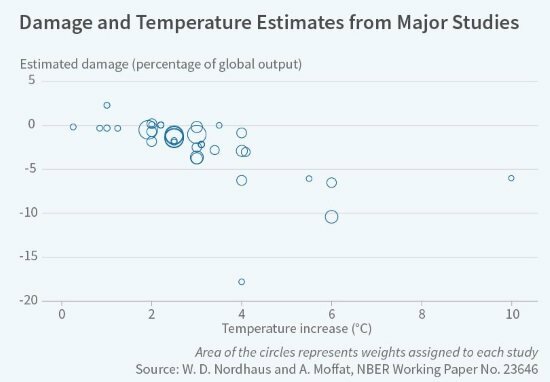 So, for any mainstream estimate of temperature rise, damage comes in at a few percent of output at most. And by 2100, the world will be many times richer than it is today. Are you referring to the same William Nordhaus who is one of the strongest and earliest supporters of a carbon tax? Why not? The Green/Left blames everybody else for the fact that far from enough is being done. Unless we accept as an article of faith that the Green/Left is right and good, and everyone else is bad and evil, and that's not a good starting point. Everybody wants to have a nice environment and a stable climate, if we can achieve that. That's trivial. Finger-pointing, droning on about "deniers", building conspiracy theories about funding of opposition, is simply not going to achieve anything in future, just as it hasn't in the past. More nonsense about something you call the "Green/Left" Repeatedly you take the statements of some and then apply it universally to those you don't agree with. A cheap, dishonest, and obvious tactic. The kind of thing that demagogues and emotionalists use when they lack facts. I think you may be the only person still talking publicly about the Hockey Stick. Most activists now evade the topic, or speak about it very quietly, like a prim family withdrawing to a back room to discuss poor Uncle Henry's drinking problem. Mann's paper, in all its awfulness, was published in 1998, rapidly shredded by people who had studied statistics, and finally disappeared by the IPCC itself in 2007, when they admitted the existence of the Medieval Warming Period, which Mann had sought to deny. You would be more tactful, as well as tactical, to draw a veil over the whole sorry mess, as the IPCC has done. So why would someone that asked that question not be viewed favorably with regard to his/her intelligence? I cannot wait to hear the answer to this one. So how much of the current warming is man made? If you answer B, how much of it is related to anthropogenic activities? This is another lie of yours, In fact, as more and more research accumulates it has been increasingly supported. But we know you aren't honest about these matters.. For instance, you have repeatedly claimed in other climate change threads that public concern about combat climate has flagged when in fact, the opposite is the case. In fact, you blame climate change activists for the decline. Well, since the facts are otherwise, shouldn't these same activists be given the credit? I'd be massively more worried about Chinese power. If anything, USA is on the decline. You're assumption is bizarrely clueless since why would the NY Times, in your words a "pro alarmist newspaper" impeach the honesty of Mann et alii. I don't read either the NY Times or the Times of London. I'm Australian. However, a newspaper's purpose is to report news, whether good or bad, and 'climategate' was a very newsworthy subject at the time. It's quite likely, and happens quite often, that after an article is published by a newspaper, the editors realize that it shouldn't have been published and that the content of the article could perhaps offend someone who might sue the paper for defamation, so they apologize. Michael Mann is famous for taking people to court for criticising him. Now that I have a clue as to which newspaper you were referring to, I suspect that the NY Times might have avoided all reportage of Climategate, such is their bias. Regarding the global nature of the MCA and LIA, the following research was conducted recently in Australia. "The warmth in the Australian alpine area corresponding to the MCA was followed by a cooling trend coeval with the LIA widely reported in temperature reconstructions for the Northern Hemisphere and seen in New Zealand palaeoclimate archives also before onset of very cold conditions through 1600 to 1700 . This period has been linked to increased southerly airflow, solar variability and volcanic forcing of climate. These 300 years of regional Southern Hemisphere cooling is coeval with evidence of widespread colder temperatures across the Northern Hemisphere, and supports a globally synchronous LIA cooling of climate." Pretty much not a concern in this link also. Not a concern for voters in this link. So concern about climate change is not in the top ten of all concerns since at least 2014 in the USA. In fact, as more and more research accumulates it has been increasingly supported. That's why the IPCC disappeared the Hockey Stick in 2007 and re-instated the Medieval Warm Period. The IPCC knew it couldn't afford to lose any more credibility by hanging onto a paper which had been eviscerated by several competent authorities. Even Michael Mann admitted that, when he altered the graph to show the MEP for a subsequent paper, tantamount to a kind of scientific plea-bargaining. So even the author doesn't share your confidence. Have you considered referring to scientific research on the subject?